Handcrafted Soapstone Candle Holders Set 2, "Fig Leaf"
A symbol of optimism and of life itself, fig leaves poise on spiral stems. Gulam Rasool is a master at traditional jali or openwork carving. 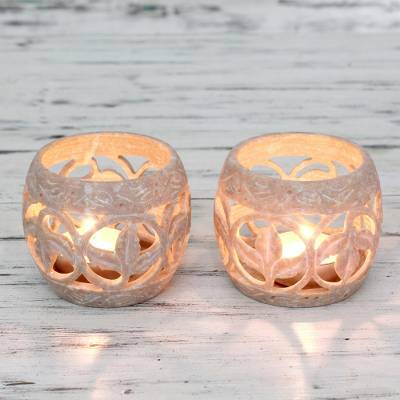 Working in soapstone, he crafts a beautiful pair of candleholders for the romantic glow of tea lights. Each (2): 6 cm H x 8 cm Diam. Each (2): 2.4" H x 3.2" Diam. "After working with my father for a long time, I ventured out on my own. I experimented with different designs and gave a new dimension to the traditional styles. At that time, there were very few tourists coming to India and all we got from a hard day's work were a few bucks from selling souvenir items made of soapstone. Over the years, however, things have changed as far as our work’s popularity is concerned. More and more tourists come to India to learn about our exquisite art. And this has helped artisans a lot.